Melonade is launched ! And the magic we thought our grand posters would do …. is already visible in our mailbox. Thankyou and keep sending your entries, while we begin with our rounds of author introductions , reviews and all that you can know about our inspirational judges. 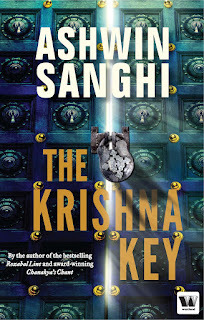 Now we present Ashwin Sanghi and his latest book – The Krishna Key. You can follow Ashwin Sanghi Here and get to know more about his previous books here. The book starts off on a rather sinister note with a meticulously planned murder of a researcher working on artifacts from the mystical city of Dwaraka. From there its a roller coaster ride a la Mathew Riley with the bad guys always a step ahead of the good guy. unfold. You automatically take up the cause of the poor professor and get frustrated each time he is out manuovered by the bad guys. Kudos to the author for such strong character development and potrayl. Like with Chanakya’s chant two stories are told side by side. The story of Krishna from the Mahabaratha and the present day search. At one point the stories collide or rather make sense as to why the story from the Mahabartha is being told again. Again pain staking research into the ancient scripture and history shows off. The book is very well researched and throws up some interesting facts. The author has merged his fiction with historical facts and blended the line so well that the reader is left wondering what if this is actually true. Especially the way the murders are shown as being perpetrated by a supposed incarnation of Vishnu. Though the author reveals otherwise, it keeps the suspense up in the first half of the book. The book manages to keep up the pace and the reader on the edge of his seat. Some characters get side lined after a while, others that were on the side line gain importance; friends turn foes and foes, friends. Literally!!! The relentless pace continues on until the very end of the book. My only grip with the book is the climax. It is sort of a let down with the author being ambiguous about the exact location of the Krishna Key. I feel cheated about having to guess what really happened to it. Maybe a prequel / sequel or even a historic fiction about the what really happened to the Krishna Key? Ashwin are you listening?